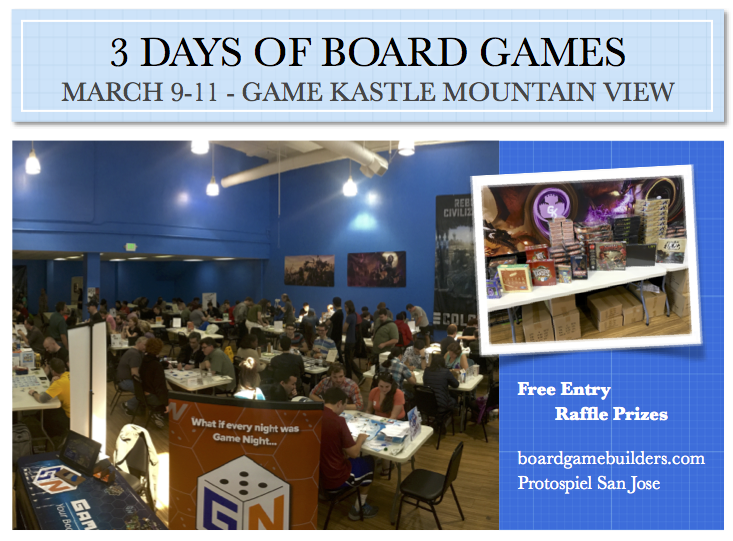 Protospiel San Jose is three days of family friendly board game play testing. Game designers and game companies come from all over with their in-development board games to hear YOUR feedback. This is a fantastic opportunity to play games, make an impact on their development, and gain more insight into the world of game design. You might just end up playing what could be the next big thing. Protospiel San Jose is FREE for players. No play testing experience is needed. While you're here enjoy free snacks, the chance to win a prize from our huge raffle pool, chat with industry guests, check out the Game Kastle store, and more! Registration for Players is not required but appreciated. Game Designers must pay for a Designer Tag Table badge and register in advance.